Andrew: “A Midwinter Night’s Dream” and “And The Whimper Is…” each focus on a different Crane brother, and each one delves into their darker sides. 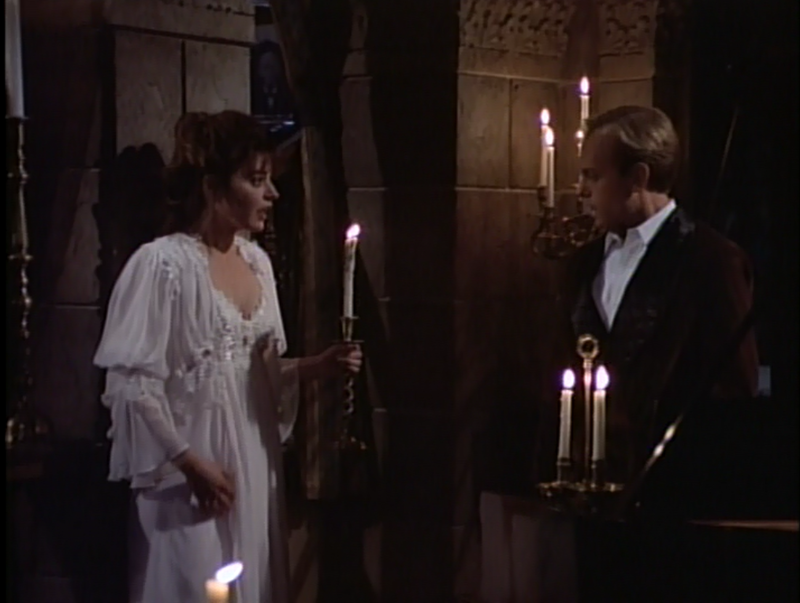 “A Midwinter Night’s Dream” is Niles’ episode, beginning the slow dissolution of his marriage to Maris. And while it is funny, it was, to me anyway, very dark. I remember watching Frasier as a pre-teen and thinking Niles’ infatuation with Daphne was funny and silly. Coming back to the series years later, Niles behavior creeped the hell out of me. 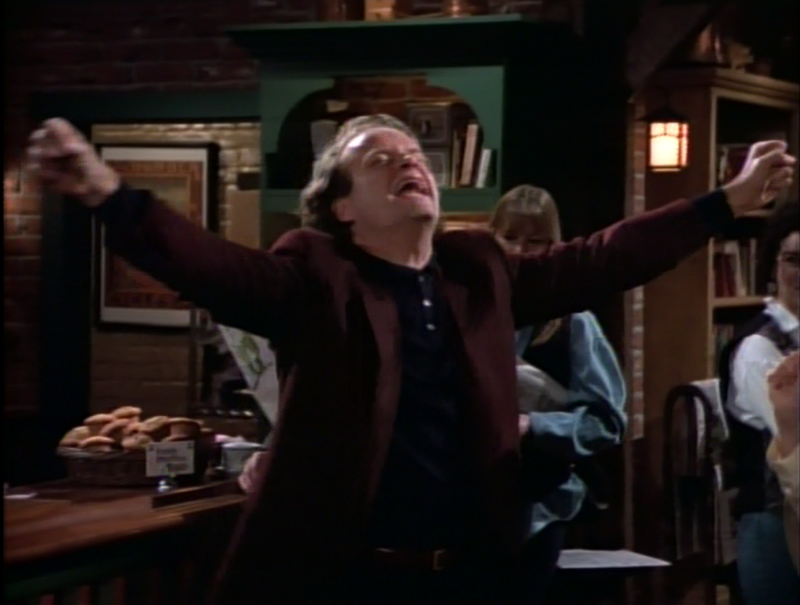 I have refrained from digging too deep into why so far, because Niles’ infatuation has always been on the fringe. Now, it is front and center, and Niles expresses his forbidden desire in ways that make my skin crawl. He acts controlling toward her, trying to convince Frasier not to let Daphne have the night off so as to prevent her from going on a date. When he learns that Daphne had a nice evening with Eric the Nervosa waiter, he breaks down crying. He acts selfishly, wishing that Daphne would save herself for him, a married man. I do like that Frasier and Martin attempt to keep Niles in check, and that they are well aware of why Niles’ infatuation is unhealthy. Frasier even calls Niles “unstable” at one point. But sometimes, Frasier, the series, plays the Niles/Daphne relationship so strangely. Daphne’s naivety borders on self-imposed ignorance, as when Niles goes in to kiss Daphne, and she never acknowledges it. As for Frasier, his bad side came out in “And The Whimper Is…,” when he is nominated for a SeaBee, a local Seattle broadcasting award. 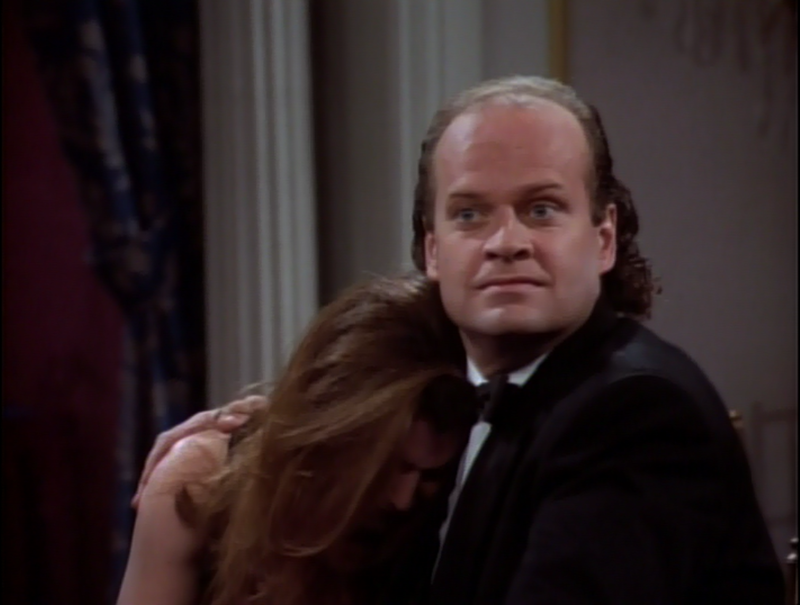 Frasier and Roz are overjoyed to be nominated, but quickly descend into a fury over the desire to win. When they see another candidate’s full-page ad in a local trade magazine, they decide to go all-out in their awards campaign, buying expensive gifts for the voting committee. Martin compares the practice to bribery, while a veteran newscaster points out that one would have to be very self-involved to campaign for an award. 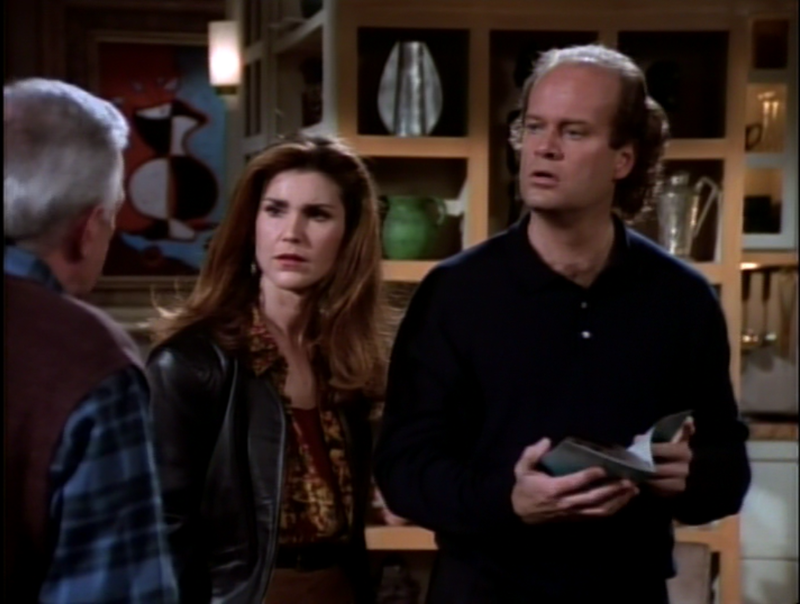 Frasier’s guilt soon takes over, but before it does, he and Roz are absolutely giddy over how their gifts have all but secured the award for them. It’s been a while since I’ve seen this episode, and I’d forgotten much of the plot. So, at first during this rewatch, I thought the episode was going to go in a different direction with Frasier’s dark side. I noticed that after Frasier learned that he was nominated for the SeaBee, he started treating the people around him worse. At Nervosa, Bebe “requested” that Roz fetch her coffee, and when Roz shot Frasier a look asking for help, the look he returned encouraged her to indulge Bebe. Later, at his home, Frasier expects Daphne to answer the door and sneers that Roz would drink alcohol of any caliber. What did you think of Frasier’s behavior? Was this out of character for him, or did it fit in with his regular snobby mannerisms? Ashley: You know my thoughts about Niles’ infatuation with Daphne from past reviews. I skip over the creepy factor you see and just enjoy the comedy. I see why it makes you feel uncomfortable but it doesn’t make my skin crawl. His “love” for Daphne is absolutely absurd. That’s what makes it funny to me and I don’t see the episode as dark. It’s just ridiculous. 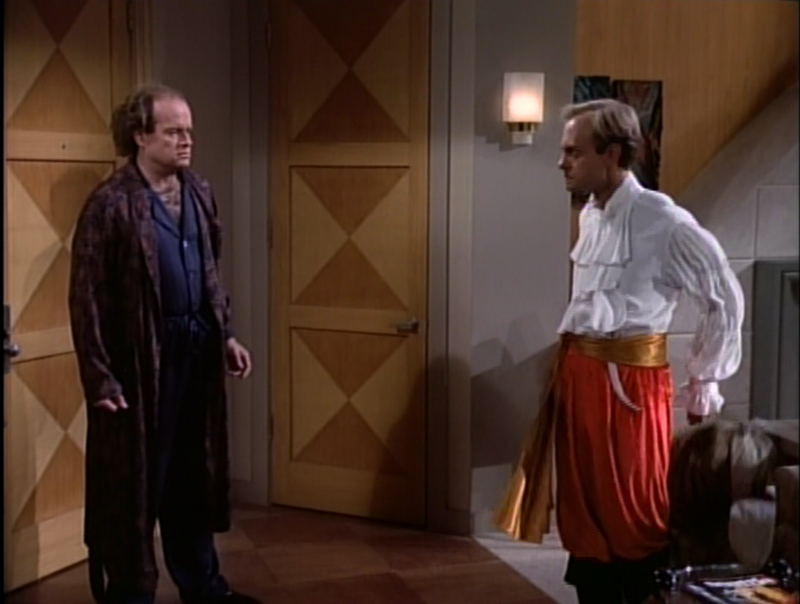 Everything about it is silly: Niles dressing up like a pirate, the storm that keeps them shut in, Frasier’s allusions to the doomed Heathcliff/Catherine in Wuthering Heights (You want dark? Read that little piece of English literature). Of course Niles can be construed as controlling, telling Frasier to keep Daphne from going out. I’m not saying it’s coming from a good place in Niles’ mind, in fact, it’s actually insane. His behavior is completely lacks any logic. He’s blinded by obsession with a woman he regards as a goddess, he’s still a (unhappily) married man, and yes, it’s all very stupid. But it’s awfully funny to watch. As for Frasier in “And the Whimper Is…”, I think his behavior was a little out of character. He states at one point in the episode that he never won anything (except for the Exestentialist Club’s “Most Likely to Be” award) so I think once he got the taste of SeaBee fever, he just went overboard. You make a good point about how he treats people though. I never noticed it before. It’s not terribly obvious but once you pointed it out and I watched the episode again, it’s true. Again, it’s a minor change, but he acts extra snobbish about the champagne and glaring at Daphne for not answering the door. Roz can be included in that as well. She states that if it weren’t for the SeaBee nomination she wouldn’t have landed Brad MacNamara, television’s most handsome man, as a date, further explaining he didn’t give her the time of day until she was nominated. And when Brad backs out to report a story about a burning building, Roz is horribly insensitive, asking Frasier if he knows anyone who has worse luck than she did right then. Her substitute date is Noel Chempsky. Roz is a confident woman so I’m surprised Noel was wrtten into this episode. She doesn’t seem like the kind of person who would “need” a date, especially one she finds a little creepy. Speaking of Roz, I will say that Roz’s request for a push-up bra from Daphne bothered me a bit, but in a different way than one would think. Just prior, Daphne states that Roz is a credit to their gender. Then Roz asks if Daphne has a push-up bra she could borrow. It bothers me because that line gets a lot of laughs. So what if Roz wears a push-up bra? Especially to an award show. It’s just an aside, and I know it’s 1994, but still, a little irksome. Andrew: The push-up bra comment is bothersome, and may be part of a greater problem that I am going to look for on this rewatch. When we were writing the review for “Oops…,” I tried to think of recurring antagonists that Frasier deals with throughout the series, and aside from Cam Winston, all of the examples that came to mind were women: Lilith, Bebe, Kate Costas, Julia Wilcox. (That Frasier ends up bedding all of these women only adds to the problem.) Frasier was usually intelligent and tolerant, but it is certainly not without its issues. I get that Niles is acting insane. Frasier himself even says as much. I just feel that there are times when Niles crosses a line from absurd in a funny way to absurd in a “why isn’t Daphne getting a restraining order” way. For example, look at how he yells at her when she mentions that she had a good time with Eric. That she acts apologetic when she nearly mentions him again shows that she thinks she’s in the wrong to freely talk about having a social life of her choosing. It seems that the more I write about these two episodes, the more “off” they seem. They certainly had funny moments; everything having to do with Niles dressed as a pirate was great, and both episodes had great non-story based jokes (the Existentialism Club joke was amazing). But the attempts at drama in “A Midwinter Night’s Dream” paled in comparison to earlier dramatic moments on the series, and the characterization in “And The Whimper Is” exaggerated Frasier and Roz’s flaws without giving them moments of redemption. As we’ve noted before, Frasier and his friends are certainly flawed, but they are basically good people. Here, not so much. Ashley: Do you think that’s part of Frasier’s issues with the women in his life? What I mean is, do you think that’s something he likes about these women? First they’re his antagonist and then part of that passion evolves into sexual passion? Or vice versa? I think a lot of what Daphne reacts to in “A Midwinter Night’s Dream” is the fact that Niles is having issues with Maris. She’s trying to be sensitive (and is still very naive). Frasier states after his insanity comment that Niles’ affection towards Daphne is “symptomatic” of problems with Maris. Niles is having problems with Maris (seems like he’s always had them actually) and to entertain himself he’s fixated on Daphne. I’m playing devil’s advocate with the Niles/Daphne relationship now because by the time we get to season seven I’ll be singing a whole different tune. The absurdity it has now is great comedy to me, but later not so much. This is the first time we’ve seen these characters be truly selfish, yes? I’m not sure if I think these episodes are off as you say. I can think of a couple episodes where these characters repeated this kind of behavior (in season five, “Frasier Gotta Have It” is a glaring example). What’s interesting is that with Bebe Frasier glosses over her behavior towards everyone: she thinks Niles is her drink delivery boy. She does it two times in “And the Whimper Is…” and apparently it’s so pervasive that Niles retrieves a drink for Fletcher Grey. And Frasier does feel some regret for his selfish behavior and is vocalized to Roz when he states that Fletcher should win the SeaBee. Andrew: The plot of building up Frasier’s ego only to bring him down is certainly a story the series will use often, and it was in play in “And The Whimper Is…” Frasier and Roz thought they were a shoo-in for the SeaBee, but the guilt from their campaign coupled with the thought that Fletcher Grey deserved to win brought Frasier down. The reason I thought it felt off was because some of Frasier’s bad behavior went uncommented upon. Daphne was none too pleased to be treated as “the maid,” but no one points out to Frasier that he is mistreating his family and friends, nor does Frasier come to that realization himself. It doesn’t make the episode bad, but it seemed odd to me.